Remke Eye Clinic is proud to offer in-house laboratory services to our patients. We are able to make a large number of our glasses right in the office to get them to you as quickly as possible! 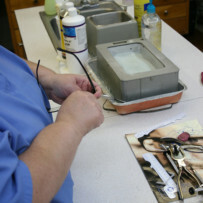 We are also able to service and repair your eyewear. If your glasses feel uneven, are hurting your head or you have a nose pad or screw loose, come on in to our in-house lab and we will be more than happy to fix them for you.